Israeli soldiers walk towards the northern Gaza Strip as seen from the Israeli border with Gaza on Monday. GAZA CITY, Gaza Strip — Israeli tanks roared into a Gaza City neighborhood full of apartment towers on Tuesday as soldiers sought to flush out elusive Hamas militants from cellars and alleyways. Terrified residents cowered in their homes or ran for cover from the fighting. The thrust into the Tel Hawwa neighborhood was the deepest yet by Israeli troops who have virtually surrounded the coastal city of 400,000 even as diplomats struggle to negotiate an end to the war in Gaza. Israel's chief negotiator will go to Egypt for "decisive" talks on a cease-fire with Hamas, officials said Tuesday. The decision to send Defense Ministry official Amos Gilad to Egypt on Thursday could be a signal of progress. Gilad had postponed the trip for days. Asked if Israel's war aims had been achieved, Israeli Defense Minister Ehud Barak said: "Most of them, probably not all of them." Israel launched an offensive on Dec. 27 to end years of Palestinian rocket attacks on its southern towns. Palestinian hospital officials say more than 940 Palestinians, half of them civilians, have been killed. A total of 13 Israelis, 10 of them soldiers, have died. Palestinian rocket fire has dropped since the offensive was launched. Some 15 rockets and mortar shells were fired toward Israel Tuesday, causing no injuries, the army said. Fireballs and smoke plumes from Israeli bombing have become a common sight in the territory of 1.4 million people, who are effectively trapped because of blockaded border crossings. Recent fighting has focused on Gaza City, where Israeli soldiers could be increasingly exposed to the treacherous conditions of urban warfare. The operation in Tel Hawwa neighborhood, one mile (1.5 kilometers) southeast of downtown, matched a pattern of highly mobile probes aimed at avoiding Israeli casualties. Residents said troops entered overnight, reconnoitered the area, and then pulled back to more secure positions. 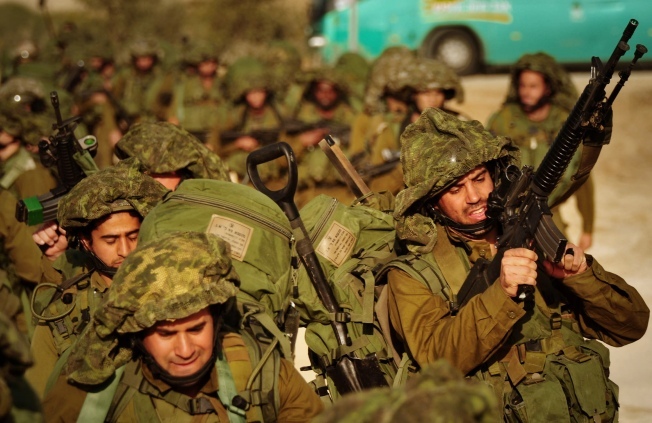 One Israeli military officer said Hamas fighters often operate in small groups of up to four and have largely refrained from confronting Israeli troops at close range. "Their strategy has mainly been to use lots of booby-traps and shooting guns and missiles from afar," the Israeli officer said on condition of anonymity because he was not authorized to speak to the media. "Soldiers are taking lots of precautions, they are being more careful than the army has ever been before in any war," he said. "Soldiers shoot at anything suspicious, use lots of firepower, and blast holes through walls to move around." Gabi Ashkenazi, chief of staff of the Israeli military, said Hamas militants have put on Israeli military uniforms to try to approach troops and carry out suicide bombings. Hamas cannot hope to score a battlefield victory over the powerful Israeli military, but mere survival could earn it political capital in the Arab world as a symbol of resistance to the Jewish state. Lebanon's Hezbollah, another Iran-backed group, largely achieved that goal in its 2006 war with Israel. On Tuesday, a Gaza resident said he saw Hamas militants in civilian clothing firing rockets from the southeastern corner of the territory. He spoke by telephone and requested anonymity because of the sensitivity of the information. Israel says it will push forward with the offensive until Hamas ends all rocket fire on southern Israel, and there are guarantees the Iranian-backed militant group will stop smuggling weapons into Gaza through the porous Egyptian border. Hamas has said it will only observe a cease-fire if Israel withdraws from Gaza. "We will not allow our enemy to gain any political achievement from this war on Gaza," said Salah Bardawil, a Hamas envoy in Egypt. Much of the diplomacy focuses on an area of southern Gaza just across the Egyptian border that serves as a weapons smuggling route, making Egypt critical to both sides in any deal. Israel wants smuggling tunnels along the border sealed and monitored as part of any deal, and has bombed suspected tunnel sites throughout its campaign. U.N. chief Ban Ki-moon was headed to the region Tuesday to press for a cease-fire, and a Hamas delegation resumed talks in Cairo with Egyptian intelligence officials. Israeli military officials say that depending on what happens with what they described as "decisive" talks in Cairo, Israel will move closer to a cease-fire or widen its offensive. They spoke on condition of anonymity because they were discussing sensitive policy matters. Palestinian medical officials reported at least 42 deaths from the conflict on Tuesday throughout Gaza. "Thank God we survived this time and got out alive from here. But we don't know how long we'll be safe in my brother's home," Mussa, 35, said by telephone. The Israeli military said it carried out dozens of airstrikes on squads of gunmen, rocket launching sites and smuggling tunnels along the Egyptian border. The army said three soldiers were wounded, including an officer who was searching a northern Gaza house when a bomb exploded. Dr. Moaiya Hassanain, a Palestinian Health Ministry official, said dozens of calls for ambulances had been received, but they could not be dispatched because of the fighting. The Gaza fighting has raised tensions around the region and galvanized anger toward Israel throughout the Arab world. On Tuesday, at least one gunman opened fire at an Israeli army patrol along the desert border between Israel and Jordan, the military said. There were no casualties, and Jordan said the claim was "baseless." There was a similar shooting on the Israel-Syria border on Sunday, and last week militants in Lebanon fired rockets into an Israeli town in an apparent attempt to draw Israel into a second front. In the southern West Bank city of Hebron, the Israeli military said, a Palestinian was shot and injured after he tried to grab a gun from an Israeli soldier whose patrol stopped him for questioning. The man later died, according to an Associated Press reporter who saw his body. Residents of the northern West Bank village of Azzoun said a Palestinian youth was shot and killed while hurling rocks at a road used by Israeli soldiers and Jewish settlers. Israeli police said a Jewish settler had fired warning shots, but it was unclear if he killed the youth. The fighting in Gaza has raised concerns about a humanitarian crisis in Gaza, where hundreds of thousands of people are without power and running water. Some aid is getting through to Gaza during daily three-hour lulls that Israel has declared to allow humanitarian supplies to be delivered. In Brussels, the European Union's aid chief said Israel has not respected international humanitarian aid during the war. EU Commissioner Louis Michel, speaking in a published interview, cited the high number of civilian casualties and difficulties of delivering aid. In Oslo, Norway, the head of the U.N. agency for Palestinian refugees, Karen Abu Zayd, urged the Israeli army to do more to allow supplies into the besieged area. "We are getting a lot of help from the Israeli Defense Forces on the one crossing that's open to get more and more trucks in, but it's just not enough," she said.